When you become an elected member of the council, your party is allocated a number of seats on different committees. I’ve been ‘lucky’ enough to have been asked which committees I had a preference to. I’ve chosen development, licensing and investment. Why did I chose these particular committees? Investment – this is were the council makes investments for its portfolio. Not really sure what will come up in this one but I’m hoping with my business experience that I can make a valuable contribution. 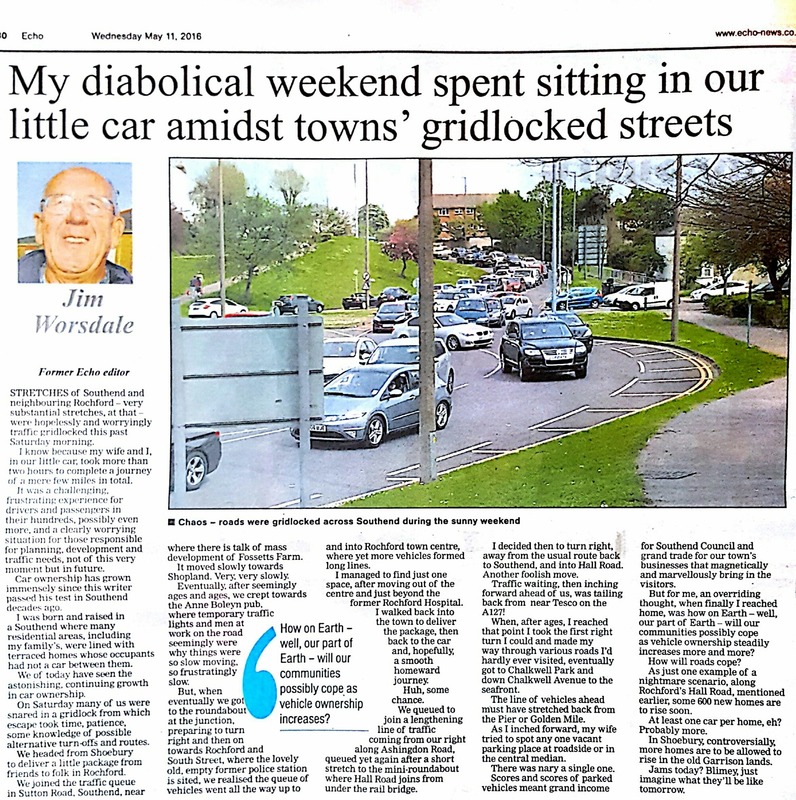 An interesting piece in The Echo today about the ever increasing traffic gridlock we face on our roads. I personally wonder how many people feel like prisoners in their own homes due to the levels of traffic on our roads. Whilst canvassing local residents in Rayleigh, a common concern was traffic with one resident telling me he wouldn’t even attempt to go anywhere before 10am and then avoided the peak time traffic at 4pm till almost 7pm. Personally I’ve turned to my push bike for those short trips to ASDA or a walk into town. Not so much fun though if you’ve got a big shop to do or the weather isn’t on your side. So what is the answer to this ever increasing problem? I’m keen to hear the thoughts of residents. Our area needs infrastructure upgrades to cope with traffic. Its not just residents but businesses too. What hope do we have of attracting big business to the area if the road links aren’t up to the job? It’s a hot topic and one that needs some urgent attention in my opinion. Protect your Property with SmartWater The Rochford District Community Safety Partnership (CSP)* works towards reducing crime, and the number of victims of crime. To help tackle dwelling burglary, we are giving away property marking kits in areas most recently affected by this offence. A proven deterrent to burglars, SmartWater® forensic marking system enables you to safely mark up to 50 items of property with traceable liquid which is then exclusively registered. Property marked in this way can then be traced back to the loser in the event of it being stolen and recovered by police. Further details about the system can be found at www.smartwater.com The product is commercially available and retails at approximately £60 – but is being offered in the target areas free of charge by the CSP to help prevent you from being a victim of crime. Police Community Support Officers or accredited volunteers will call to deliver the product and give you simple instructions in how to apply it to your property. We hope to commence distribution from January. If you are interested in taking up this offer please contact the Community Safety Team at Rochford District Council on 01702 318103 or by email [email protected] if your home isn’t in a target area but is within the District we are able to offer the kits for a small charge. Tomorrow, will mark the first meeting I will be attending as a Rayleigh Town Councillor. Whilst slightly nervous, I can’t wait to attend to represent the Victoria Ward. More details to follow to let you know what was discussed!